Our lovely staff village is located just outside Letaba rest camp about 3 kilometres from the four-way junction on the left of the tar road towards Olifants camp. It has around 15 houses, a few flats and a swimming pool. Unlike the main rest camp, which is completely surrounded by an electric fence, the staff village is unfenced. Just the gardens around the houses have a man high chicken mesh fence around them. There used to be electric fence wires at the top and the bottom, but the elephants would get so clever at breaking those top and bottom strands that maintenance gave up fixing them a long time ago. So the elephants have only this flimsy fence trying to prevent them from coming into the yard. And a fence like that means nothing to an elephant. We cannot exactly blame them. Especially in the dry winter months, our gardens probably look a lot more appealing than the dry bush around us. Even with the water restrictions in place. There was a time where they would come in so that Steven actually stopped asking maintenance to put the fence back up because the fence would be up the one day and down again the week after. It was an extremely hot summer. Week after week the days would be so hot, stepping outside felt like stepping into an oven. The nights would barely cool down. We had bought a little blow-up pool for Stevens oldest kids to splash around in and cool down during the weekends they were here. We would put a little swimmers nappie on Alex and chuck him in there too. He had just started walking. My mom had sent a present with for the children: an enormous blow-up crocodile. The kids loved it. They would take turns sitting on top of it and trying to throw each other off. The three of them were having such a jol. They always do when they are together. The children were inside having lunch and had left the crocodile bobbing around in the pool. All of a sudden there was a huge commotion outside. Vervet monkeys were alarm calling, squirrels were chattering in alarm too. Steven and I went outside to see what was making the animals so upset. We knew there was a leopard that sometimes walks past the staff village down in the stream, but surely it was too hot for him to be walking around? Maybe it was a snake? The monkeys were sitting in the tree next to the driveway looking down at something, making terrified alarm calls. But not at a snake or a leopard… they were screaming at the blow-up crocodile in the swimming pool!!! Oh my, we had such a lekker laugh! In the days to follow, we would have to take the crocodile into the garage when the children were not playing with it, otherwise, the monkeys and squirrels would get upset all over again. Now with the fence down, we actually had to blow down the pool at night and pack it away, along with the crocodile, to make sure that the hyena’s that frequent the staff village at night, don’t bite the inflatable pool and ruin it. 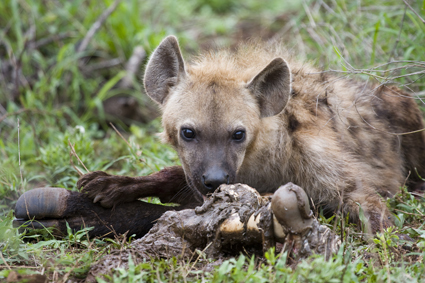 There is no patching up inflatable pools after a hyena sinks its teeth into it. We learnt that the hard way. Twice. And then one night I completely forgot again and both pool and crocodile were left out on the grass overnight. The next morning we woke up to a very sad sight. A hyena had ‘killed’ our crocodile and dragged the poor thing across the driveway. The pool had not survived either. That was the third pool we had lost in the space of 6 weeks. This hyena was getting cheeky…. Time for the fence to be put back up! Oom Coenie promised to send the fencing guys over as soon as they were back from their project in the Lower Sabie area. We decided not to buy another pool until the fence was back up. The kids would play in the sprinkler in the meantime, which they also loved. And Alex, typical bush child just loved playing in the mud. So I went outside to see what those white things on the driveway were. When I had a closer look, I started laughing out loud. You know those white round little soaps they give to you together with your towels in all the units in the rest camps? Well, they also give them to the wilderness trails guests and we had a box full of them in the garage, waiting to be taken to the trails camp. The naughty hyena (I honestly believe it was the same one that killed our crocodile), got hold of the box, bit it open and left the contents strewn all over our driveway! There were little soaps everywhere! All the way up to the Mopani bushes right outside our yard, where we eventually found the box. Steven and I joked that this was the only hyena around Letaba that would actually smell clean!! I really enjoyed this story Linda. Hyenas are my favourite animals. They are so clever. You are blessed to be living in the bush like this. Thank you Liza! We feel very lucky, although with two small kids it can be quite challenging too! Thank you for sharing your life in the KNP with us. I envy you (I looooove the bush and particularly the KNP) and so often when visiting and enjoying ourselves we forget or don’t even give a thought to the people ‘behind the scenes’. Your stories of your life in the KNP will change that for me at least. Pleasure Noel, and thank you for taking the time to read my stories! Thank you so much for your story! May you write meant more ! I am also a Kruger addict and truly envy your life . Thank you Valerie! Appreciate it!! Greetings from a cold Letaba this morning! Delightful and funny story Linda. It’s such fun to read about your life in the bush. You’ve inspired me to start planning my next Kruger visit.